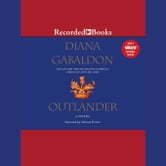 Outlander, Diana Gabaldon's landmark novel of Scottish lore has captured the hearts of millions of readers around the world and catapulted her to the top of the New York Times best-seller list. Intrigue, danger and desire merge in this lush novel of loyalty and time travel. In 1945, Claire Randall, a former combat nurse, is back from the war and reunited with her husband on a second honeymoon. Their blissful reunion is shattered when she touches a boulder in one of the ancient stone ruins and is instantly transported to a Scotland torn by war and raiding border clans . in 1743. 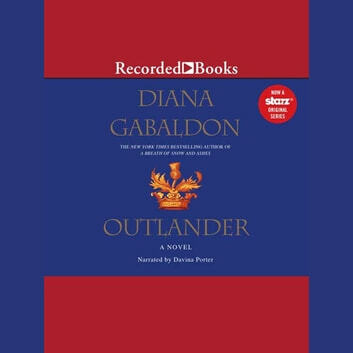 Will Claire find her way back to her own time, or is her destiny forever linked with Clan MacKenzie and the gallant James Fraser? Davina Porter's lyrical narration will launch listeners into an exhilarating world of heroism, pulse-pounding adventure, and breathtaking romance as one woman is torn between past and present, passion and love. This was an epic story told expertly of life in another century. You learn about life there and the old ways meeting newer ways in relationships. Phenomenal book! The speaker is amazing. I have watched the show on TV and could picture the characters as she was reading it.